Jibril Rajoub, a member of Fatah's Central Committee, honors the released prisoners at a special ceremony celebrating their return. Speaking in the name of the Fatah movement at a ceremony in honor of the released prisoners in the recent Shalit deal, Jibril Rajoub, a member of Fatah’s Central Committee, praised Hamas for kidnapping the Israeli soldier, Gilad Shalit. 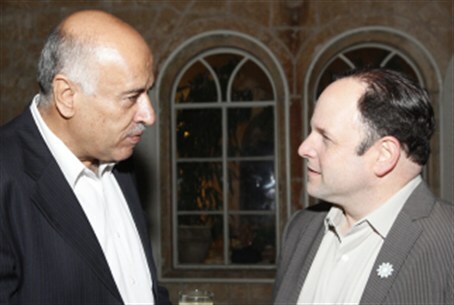 Jibril Rajoub perhaps identifies strongly with the released prisoners in the Shalit deal as he was once a prisoner himself. Rajoub served a life sentence for throwing a grenade at an Israeli army truck in 1970. He was released in the “Jibril Deal” in 1985, when 1,150 Arabs were freed for three Israeli hostages held by Ahmed Jibril's PFLP terror group. Many of those released went to form the bulk of the PA leadership in the First Intifada, which broke out less than three years after the agreement was made. PA Chairman Mahmoud Abbas recently announced his decision to build new homes specifically meant for the terrorists who were released in the Shalit prisoner exchange deal. Israel has already freed 477 terrorists, 270 of them with "blood on their hands" in the first part of the deal, and an additional 550 are to be released in the second phase. According to Saturday’s announcement, the construction of the homes will be financed by the Palestine Investment Fund. “The issue of the prisoners is a top priority for the Palestinian leadership,” Abbas was quoted as saying at a recent meeting with some of the terrorists who were freed. He welcomed the terrorists and reiterated his previous demands that Israel release 1,000 additional prisoners.